Blue Moon Queen Mini Kitchen Bachelor Suite is one of 4 privately owned studio suites at Inn of the Sea Resort. It is a fully furnished with dresser and side tables, 2 comfy chairs, a Queen bed, and looks directly out to the ocean. It has cable TV, WiFi, fireplace, closet, kitchen pantry and full bath. There is a nice sized ocean view balcony in front and a lovely landing deck in back for enjoying different times of the day. The kitchenette has a large window and is equipped with 2 burner stove top, microwave oven, convection toaster oven, Keurig coffee maker and all utensils. 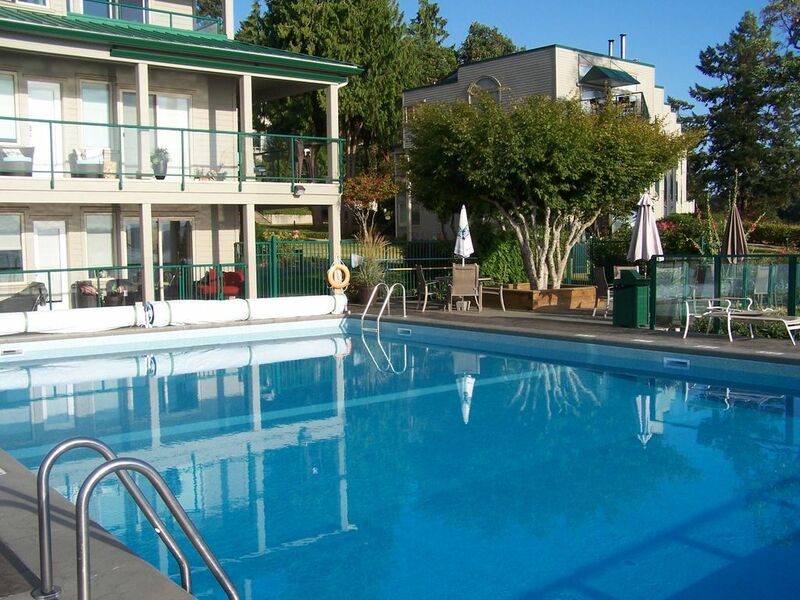 Make this your home away from home while on Vancouver Island. Our great amenities include a Deep Sea Dock, an outdoor fire pit, heated Pool and Jacuzzi, a Kids play area, and a large tennis court. We have 3 BBQ stations and many different patios and places to sit including the pool, the herb garden, or near the beach. Picnic on the beach, go for a swim in the ocean, or take your chairs to the dock and watch the moon rise ~ It is pretty spectacular in any season! Sea breezes, Sun filled days by the Pool, and Sandstone walks. Crabbing and fishing is a favorite pastime from the dock. You can have a fire on the beach and watch the evening coming down. Good Restaurants and Pubs are 10 minutes away. The Mahle House for gourmet, and the Crow and Gate for English style fare. In town check out Asteras Greek Taverna, Delicados for lunch, the Lighthouse Bistro or Dingy dock Pub all great menus and fun places to be. Trails and Parks are abounding very near by. Yellow Point Park, Roberts Memorial, Cable Bay, Hemer Park. In Nanaimo there is Westwood lake, the beautiful Sea Wall walk in down town, and hiking trails throughout Mt. Benson. Golf is a year round sport in Central Vancouver Island and we feature all ranges of clubs. Cottonwood and Eaglequest are nearby, and Nanaimo and Nanoose are two other favorites. Shopping for groceries is 10 minutes away in Cedar, or farther afield in Ladysmith and Nanaimo. For big box items Nanaimo, Duncan and Victoria are where to go. Boating, Kayaking or Canoeing are the very best in summer months. Garden Tours are a wonderful thing to do if you are a garden lover. The famous Butchart Garden is a splendor to see, about 1.5 hrs away and locally we have fabulous tours in Yellowpoint. Farm Markets: Cedar Farm Market on Sundays is just down the road, Nanaimo has Wednesday afternoons and Friday mornings, Saltspring on Saturdays is a must see, and Duncan on Saturdays is year round! All markets are relatively close by with McNab's Corn just down the road who has fresh corn available right at their farm, and the maze is open in the early fall. Parksville Sand Sculptures, a spectacular event and a must see if you come in July. Wine tasting and tours are a fun way to check out local flavors in our Cowichan Valley. Some of the best wines are made locally. Whale watching in Victoria a day trip and Telegraph Cove, an overnight trip. Fishing on the Straight of Georgia, or the west coast for springs make us your base camp for it all! Welcome to all my guests from all over the world. I am happy you have come to stay. I have traveled the world over, so I am pleased to offer a place for travelers to come to in Beautiful British Columbia. Everywhere you look you are amidst our glorious natural beauty. You can enjoy sitting on the patio having morning coffee, or evening glass of wine while you watch the sun and moon rise, see the ocean, play in the ocean or pool, go for walks in the forest or beach, and spend leisure time relaxing in our Resort. We are in a forest and on the ocean allowing you to feel like you are completely away from civilization, but 10 minutes down the road, you can get everything you need at Cedar Shopping Center. We have a farmer's market on Sunday in Cedar and several in Nanaimo on different days. There are 4 wonderful restaurants within 10 minutes drive, and lots of hiking and walking trails near by. Artists working from home allow visitors to come most of the year, with the Yellowpoint Christmas Craft Fair tour in November. You will find that there is much to do right here in our rural Yellowpoint area. We are centrally located so make an ideal base camp for exploration further afield, like Tofino, Victoria, the sandy beaches of Parksville and Qualicum, or further up Island. There are many Unique Benefits while roosting at Blue Moon Condos so come enjoy the Island this season. Washer and Dryer in separate building near tennis courts. Must burn only fire logs made from compressed wood. Nearby 5 minutes by car away. We have a shared laundry facility with 3 washers and 3 dryers.They use loonies, 2 for a wash and 2 for a dry. Pets are generally welcome, but it is important to ask first. We do have a bag dispenser especially for doggy's We have 3 BBQ stations with patios surrounding the buildings. All plastic wear is included and must be used around the pool which is a no glass zone. Beach towels are provided and must stay in the suite when you leave. Credit cards are accepted through Paypal. If you want to have a housekeeper while here, please mention this when you make your booking. Our stay was amazing and we loved the suite! Everything was included and made our stay so comfortable. The pool and hot tub were perfect for relaxing at night and the view from our balcony was incredible. I would recommend this place to everyone. We had an absolutely fantastic time! We loved this base for exploring the island. Toured everyday, amazing hiking close by, cute little restaurants, and a ton of farmers markets. Always looked forward to coming back here at the end of the day for happy hours and a dip in the pool. Met a lot of beautiful people at the resort, that were so pleasant to visit with. One thing we noticed was how the children actually play, swim, crabbing, and no computers or gaming, was amazing to see. Roz was the perfect host, never actually met her, but received a ton of messages on great advice and tips, with a sweet sense of humour!!! We will be back to the Inn of The Sea!!! Oh you two are the sweetest folks. So glad You had a great time and got to explore the island in its entirety. The markets are great here and we have very hands on farm to table folks here willing to share all their knowledge and goods. The pubs and restaurants are great and all the gulf islands are wonderful places to explore with a variety of arts and crafts. You are most welcome to come back at any time. I look forward to meeting you next time too. Wonderful host, lots of adventure..a great send off the last night from the neighbours and locals. The apt. was well decorated, clean and had a beautiful view. Roz went above and beyond. thanks for everything, and i mean everything!! would highly recommend staying at her rental. Thank you so much Joan for this great review, it is especially appreciated, and I know you will have many a good laugh over our last day visit together. Cheers and I wish you well on your new future adventures, and may they be as sweet and considerate as you!! It was a pleasure doing business with you. PS, thanks for letting me interrupt your stay with the various trades that came and went while you were here house hunting! Fantastic locatation, Beautiful Condo, and an absolutely Wonderful Owner! The first day we arrived at Blue Moon Condos I was overjoyed with the place. Everything about it. More than enough room for our 2 families (6 total), everything you could possibly need tucked away in drawers and closets, an amazing ocean view... too much to mention. My kids went swimming in the ocean-side pool once or twice a day. We found a fishing charter and had a great time out on the ocean. There is so much to do in the area and this condo is situated perfectly to be able to travel up and down island. My big worry was that, being used to staying in hotels, I thought it might be strange to stay in "someone's" personal condo. I was completely wrong. I instantly felt at home and comfortable in a way that I've never felt anywhere else. Rosalind has done an amazing job decorating and outfitting the place. I only wish we could have stayed longer. There is always next year. We don't travel a crazy amount, but we've been to Mexico, NY, Hong Kong, Sweden, Paris etc etc, and I have to say this was one of my favourite vacations of all. Beautiful accommodation, a lovely, helpful owner, and a stunning location. I am one of the luckiest vacation home owners! My guests are gracious, wonderful folks who bring out the best in me to continue to provide an outstanding vacation experience for them consistently. Thank you for your review[s] and please don't hesitate to come again, you are most welcome. A little piece of paradise! A place where beautiful memories were made. This was our first time, as a family of 6, to take on a vacation this way, rather then staying in a hotel. I will be completely honest in saying I was very nervous . It reminded me of house hunting. Looking for that perfect place. I know most of you will know what I mean by this, as pictures of homes for sale look awesome, but then when you go look, it's not even close. That being said, there was absolutely no disappointment ! Bluemoon Condo, was clean, and fully ready, with all the fixings! Beds, bedding, towels, pots, pans, dishes, dishwasher, microwave, barbecue, washer and dryer available, heck, there was even a Kurig coffee pot! Score!! It felt like home❤️ We were able to comfortably fit all of us, even our sons dog was welcomed! I cooked, most the time while we were there, saving huge amounts of dollars, by being able to do this! This place is nestled, almost hidden away. The views, breathtaking, the scenery, quiet, serene. Very clean, and well maintained property by a wonderful fella by the name of Ian. A heated pool, a hot tub, the ocean, and even a campfire while looking out to the ocean and listening to the waves. I just can't say enough about this property. A short drive in either direction will take you to Ladysmith, or Nanimo! Shopping made easy! The owner of this Condo is Rosalind. Now here is a woman who went above and beyond to make our stay as comfortable as possible. A friendly, smiling face, with a big beautiful laugh. Her home was your home, and she made sure of that! A herb garden waiting for you to use. Beautiful outdoor plants, as well as indoor ones to brighten your stay. Rosalind was full of know,edge about the area, ready to answer our questions! I felt like I had known her forever! I would 110% recommend this place to family, friends, and yes too even you, strangers. A place you will never forget, as it will leave imprints on your heart and in your soul. The condo we rented for 10 days was beyond our expectations and the property was gorgeous! The booking process was easy and everything we were promised they delivered on. My wife used the pool often and it was sparkling clean which she really appreciated. The property is very well kept and very tidy. The units were fairly soundproof but you could definitely smell the bacon frying every morning (which my son really liked). We took our little dog and he loved the property and we loved the fact that we could have him with us on our holiday. There is a park near the entrance to walk your pet or let them do their business which was great. He wanted to play with the little black rabbits that inhabit the place and which you can approach quite close to...unless... you're an excited little dog! This is truly a family place to stay and we had a wonderful time. It was so peaceful and never seemed crowded that it almost seemed like our own place at times. The condo looked exactly as it is represented on the internet site. The property caretakers were very pleasant and very helpful when we had any questions. Every guest I saw there seemed really happy with their units and I heard of no complaints from anyone. The dock was nice and my son fished off it regularly. The only thing that would have been nice to see was a fish gutting station or trough on the dock as some people who brought in fish they caught in their boats cleaned them on the end or side of the dock which made a mess for others even though they rinsed it down. I have no problem recommending the Inn of the Sea condos at all and hopefully will be back. Than you for your review. I am really glad you had a good stay and that everything was an accurate account of what you were told... and the best part was that it exceeded your expectations...that is great. We try our best to make sure your home away from home is a great experience. We will certainly take into consideration the fish cleaning trough for future. It has been something we have talked about and will hopefully implement as more and more fisher folks come here for their holidays and discover they can go fishing both from the dock and farther afield....although we do not rent boats, they are available for rent in Nanaimo or Ladysmith or you can trailer your own boat and launch not too far away, then dock it at our dock while you are staying with us. Hopefully you will come back, and recommend our property for future guests. Rosalind McKenzie and Blue Moon Condos. We are situated between Nanaimo and Ladysmith in an area called Yellowpoint. We are on 3.5 acres, on the waterfront, in privately owned condos. Blue Moon Condos include 213 at 3600 Yellowpoint Road. Activities in the Fall and Winter in the Yellowpoint area include going on our Cedar Yellowpoint Artisans Tour for Christmas gift ideas by fabulous artists. On the last Thursday of November we have our annual Ladysmith Lightup where the whole town lights up for Christmas, complete with a Christmas parade and fireworks for fun. Nanaimo holds many annual Christmas Craft fairs that you can view by checking out Harbourliving.ca, and through the Blue Moon Condos website and blog spot. Golf: Golf is a year round sport on Vancouver Island. We feature many golf courses both near us, and a little farther afield. Nanaimo Golf Course, then Fairwinds in Nanaoose, Morningstar in Parksville and Eaglecrest in Qualicum. Policies 3 night minimum stay in summer season mid June till mid September. There is an option to rent for weekly and monthly stays in shoulder seasons from mid September till mid May. Contact owner. Damage Deposits are refundable if there has been no damage in suite with amounts changing seasonally. Please enjoy all the grounds around Inn of the Sea Resort. We appreciate that things are left as found and spaces have been cleaned after your use. There are designated BBQ areas for your use. Please clean them for next user. Hours for pool and Jacuzzi are 8 am till dusk. No glass of any kind is allowed in the pool area including glass coffee cups, wine or beer bottles, wine glasses or plates. Children under 12 must be accompanied by adults. Laundry room is available from 8 am till 10 pm daily. $3 per wash and $3 per dry. Please bring loonies for laundry use. Beach fires only when allowed. Check in is 3 pm Check out is 11 am. We do not guarantee weather conditions. If you cancel your reservation 3 months before arrival we will refund your deposit minus $50 for administration fees. If you cancel after that period, your money will be refunded if your vacancy is filled, and you can use the reservation for the next season.